NETWORK FINALS: There were no changes from the preliminary numbers for the networks on Friday. CABLE HIGHLIGHTS: It was a strong night for Disney Channel, which had the top-rated show on Friday cable with its remake of ADVENTURES IN BABYSITTING at 0.76, preceded by 0.56 for GIRL MEETS WORLD (a sizable 0.22 increase from last week), and followed by the new BIZAARDVARK at 0.47. Discovery’s ALASKAN BUSH PEOPLE gained 0.07 to 0.71, and HOMESTEAD RESCUE was steady at 0.40. On Adult Swim, DECKER: UNCLASSIFIED lost 0.07 to 0.52, and CHECK IT OUT dropped 0.03 to 0.42. HBO’s REAL TIME WITH BILL MAHER climbed 0.06 to 0.37, and VICE gained 0.07 to 0.22. We’s MARRIAGE BOOT CAMP rose 0.08 to 0.32, with lead-out MILLION DOLLAR MATCH at 0.25. History’s ANCIENT ALIENS was up 0.05 to 0.29. Spike’s BELLATOR was at 0.24, preceded by a KIMBO SLICE special at 0.17, and followed by BELLATOR KICKBOXING at 0.17. 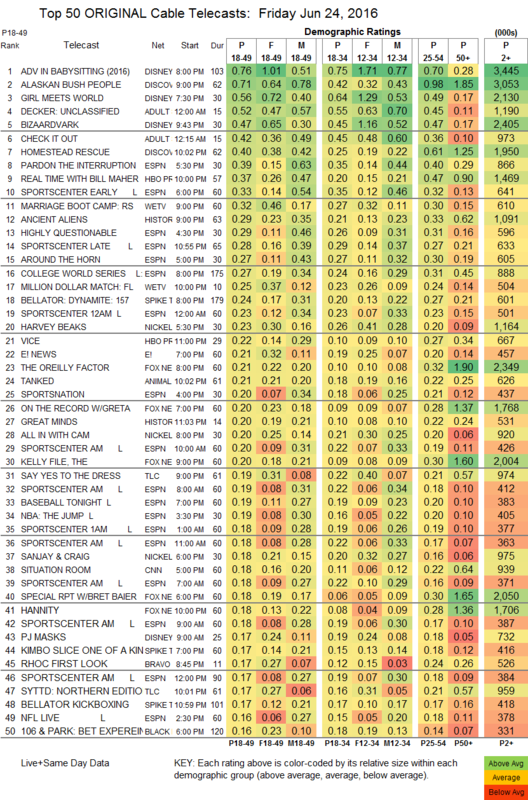 TLC’s SAY YES TO THE DRESS fell 0.05 to 0.19, with a related lead-out hour at 0.17. 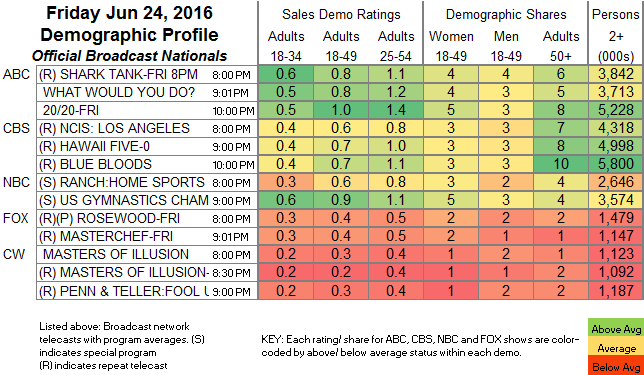 On Syfy, WWE was up 0.02 to 0.14, and the season finale of WYNONNA EARP gained 0.04 to 0.14. Cinemax’s OUTCAST held at 0.06. Both episodes of IFC’s COMEDY BANG BANG were at 0.03, with 62/65K total viewers.